Safety Meeting Records owns this Saturday, bringing three of Connecticut's prime to Cafe Nine. Meg recently wrote about M.T. Bearington's freakishly killer record, The Cloak of Nouns and Loss here: CLICK. Riff-loving Atrina supported ctindie.com at the very beginning with a great interview. 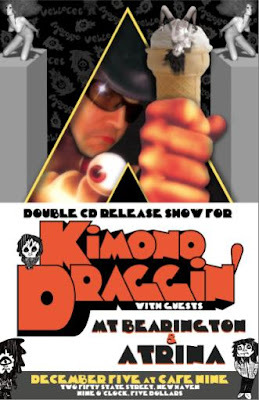 We have not, however, talked enough about Kimono Draggin'. Their "cosmic art rock" is your doctor's number one recommended prescription against banality and sanity. Take in loud doses. They're more addictive than crack, but at least you won't lose your teeth. Facebook event page here: CLICK. Then, on Sunday, Shaki brings in Parts and Labour and Atrina is opening! Deets are to be found here: CLICK.